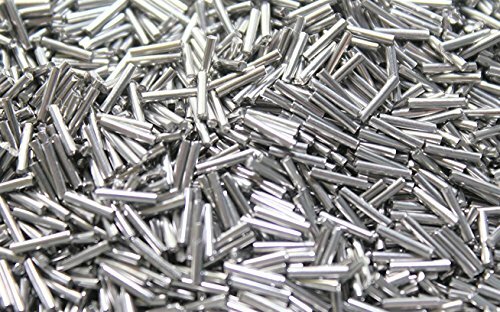 Stainless steel pins never wear out and will last a lifetime. These are perfect for use in a wet tumbler for polishing brass, steel, aluminum, or titanium. Most commonly used for brass cartridge cleaning, the .047" diameter prevents the pins from getting stuck side by side in flash holes but they will pass through all flash holes one at a time. Fill your tumbler with pins and brass but be sure to leave space to allow tumbling action. Add clean hot water until the tumbler is nearly full. Cold water will work just fine but hot water cleans faster. Add approximately ½ tablespoon Dawn liquid dish detergent (or comparable brand) per 1 lb of brass. The amount of detergent used is not critical but must be enough to ensure good suds remain at the end of the cycle. Run until clean which is typically between 30 minutes and 2 hours. When first starting out check every 15 minutes to see if additional cleaning is necessary. If you don't see suds after you open your tumbler either you are not using enough soap or the soap is breaking down from running too long. Optional: To achieve the best possible shine add a tablespoon of Lemi Shine dishwasher detergent powder per 1 quart of water. The active ingredient in Lemi Shine is citric acid which dissolves zinc. Remove, rinse, and separate the brass immediately upon stopping the tumbler. As soon as the agitation stops the dirt will start to stick back on the brass so don't leave it sitting idle in dirty water. Shake dry the brass in a colander and then pour them into the center of a large towel laid out flat. Gather the corners of the towel and roll them around to remove as much water as possible. From there air dry them several days on plastic trays with an occasional turn.